How to attract new visitors to your website. Hello from Aviation Ad Network! As a business and website owner, you know how important it is to grow your customer base and audience. That's why we're writing: to suggest a way to attract new visitors to your website. Your current visitors likely know and search for you by name and, as a result, your website shows up in their search results. But prospective visitors tend to search by general topic, with terms like "aircraft for sale" or "airline tickets" or "aircraft repair," in which case your site may be more difficult to find. Here's the good news: You can help prospective customers find you with ads on Aviation Ad Network and win more loyal visitors and customers for your site. Getting started is easy. You can set your own budget and your own price for ads. To redeem your free advertising, just Try Self Service before 11/2/2018, set up an account and use the special code printed at the bottom of this email. Will you give Aviation Ad Network a try? We think it you'll find it's a great way to attract new visitors. Just use the code below and set up your Aviation Ad Network account before 11/2/2018. There's no obligation and it's easy to get started. Thanks for your partnership with Aviation Ad Network! Learn more about Aviation Ad Network. Terms and Conditions: * Promotional credit must be applied to a new Aviation Ad Network when creating an Aviation Ad Network account and is valid only for new Aviation Ad Network customers with self managed signup accounts. - Advertisers will be charged for all advertising that exceeds the promotional credit. Advertisers can suspend their ads anytime before the promotional credit amount is exhausted if they do not wish to receive additional advertising charges. - Offer subject to ad approval, valid registration, and acceptance of the Aviation Ad Network Program standard terms and conditions. - The promotional credit is non-transferable and may not be sold or bartered. - Offer may be revoked at any time for any reason by Avjobs Inc. - One promotional credit per customer. - Offer valid only for sign ups through the URL provided for the promotion by customers with a billing address in the US or Canada. - Your use of this voucher and/or the promotional credit constitutes your acceptance of these terms and conditions. Offer void where prohibited by law. - Phone support available Mon - Fri, 9am - 5pm MT - Expires 11/2/2018. Avjobs is flexing its muscle in aviation recruiting with more ways for business to promote aviation job listings. The new Hosted Careers Mini Site feature gives companies another way to attract top talent to current openings. These Mini Sites also help companies to market their products, services, news and announcements to connect with more followers on social networks and promote themselves with the Aviation Ad Network to get their open position in front of more candidates. All employer accounts come with the new Hosted Careers Mini Site feature, and Avjobs is experimenting with a slew of new features tied to mini sites. Based on the traffic and behavior behavior we’ve seen on Avjobs, we’re running tests on job postings and applications from candidates to improve the overall effectiveness of the process. Another new posting notification feature allows companies to formally share a job opening with related details like job title, company name and location. The special delivery and formatting differentiates job postings from other content and attracts eyeballs in the crowded job availability market and applicant pool. Company job postings show up on the Hosted Careers Mini Site, creating a dedicated landing place where companies can send job seekers. Companies get the added benefit of potentially gaining new followers whether or not someone applies for the open position, compared to a relatively static Careers page on a company’s website. Job postings include an “Apply Now” button that launches a standard job application flow, but pre-populated with information from a user’s profile. That helps people quickly apply for jobs without typing in redundant information. Submitted applications are received by companies as an Avjobs Message (job application) sent to the email address of the company’s recruiter, website or ATS. Avjobs added personalized RSS Feeds for company jobs last year, which provide additional syndication in the aviation industry. 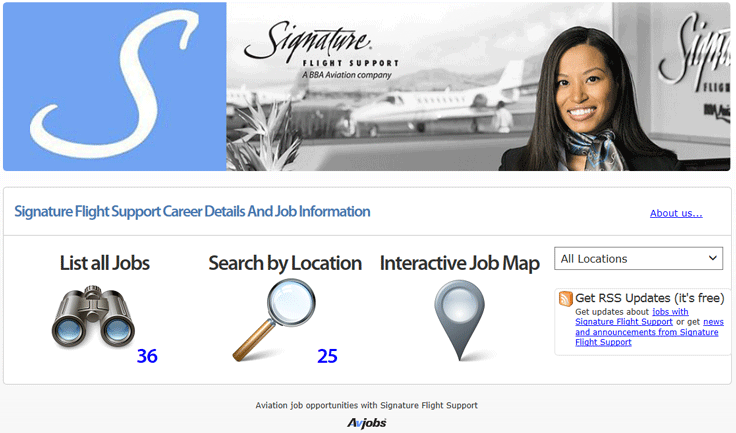 Now businesses are also able to show their job postings to more people with Aviation Ad Network ad offerings. Avjobs opportunity here combines its ubiquitous reach, personal data and engagement. Avjobs applicant profiles, are filled with extensive information about their past jobs titles, employers, education and interests. Recruiters can target job posting ads so they reach people with the right credentials in preferred locations. And because people browse Avjobs and the thousands of Aviation Ad Network publisher sites constantly, those users are likely to eventually see the ads. Most Avjobs users visit when they’re updating their profile about a new job, or are actively looking for one. But Avjobs can reach people not even thinking about a job, yet could be convinced to apply for the chance at a higher salary or better job title. That’s the same reason Avjobs has been able to build giant brand and performance advertising businesses. Avjobs offers demand generation, drumming up interest people didn’t know they had. Advertiser and Publisher accounts available.